Everyone has bad days. Sometimes, several in a row. There is no such thing as Happily Ever After. Everyone has a Once Upon A Time that just continues on and on until the abrupt ending. The story unfolds with climaxes, resolutions, new chapters, plot twists, subplots, genre switches, and a constantly shifting array of characters. I, personally, have had a wacky week. I have had some super great things happen and some trials that have sent me in a tailspin. I have found myself gasping for air from the rollercoaster ride that is my life. There are thrills and scares and the uneventful parts where you ride slowly up a hill not knowing what’s coming on the other side. Bad stuff will happen, but on the flipside, good stuff will happen too. Sometimes I think we expect that if we take certain steps and do everything a certain way that we will be immune to bad happenings. There are many things we can do to make our story mostly a good one, but there will always be circumstances and the actions of others that are beyond our control. I think the most important controllable factor is our own attitude. When we wake up each morning we should be ready to embrace the good stuff heartily and be prepared to tackle the bad stuff that jumps out at us. I also firmly believe that every cloud does have a silver lining but sometimes you have to look real hard for it, or even create your own. So, if you are having a day like mine, which started off with a rousing argument with my husband, followed by my son turning up with pink eye on my first day of a new job, no available babysitter for said child with pink eye, not having the new medical insurance coverage to address the pink eye kick in until March 1st, realizing suddenly that I didn’t have the correct shoes for my new job, my husband threatening to give my dogs away (different argument), and then, to top it all off, I burned my grilled cheese sandwich as I was writing this post. Yes, there is a silver lining here somewhere, and I will find it. Sometimes it is as simple as gaining the knowledge that you will not allow yourself to wander into a similar situation again. Or, maybe you, my dear reader, are benefitting somehow from my reflection of the aggravating beginning of my day. “This is a song to all of my friends. They take the challenge to their hearts. Saying goodbye to long standing fears. *My husband and I talked it out and have a better understanding. *I didn’t need to take my son to the doctor because I found some left over eye medicine. *My husband ran out and bought me the appropriate shoes. *A new grilled cheese was made and eaten. *Excedrin did wonders on my resulting headache. I’m glad you wanted to end the day on a positive note. (((Hugs))) we all have those days. I’m glad you were able to maintain a positive outlook. It’s not always easy to do. Sorry for all the yuck you had to endure. 😦 But so happy things started to turn around. Grilled cheese! – Yum! Take care of yourself and always keep those lines of communication open. My thoughts are with you. Oh, Kellianne. I’m so sorry to hear of your trials, but pleased the day ended on a much happier note. 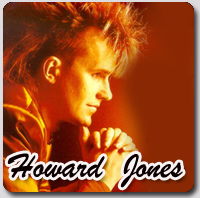 What’s with the Howard Jones? Hmm! He was cool back in the day, but he was happening as I was getting into my heavy metal days. Perhaps I’ll troll on over to iTunes and refresh my memory with Mr. Jones. Any songs that I definitely have to have on my iPod? Now, tell that Krystal to step aside! I’ve got some hugs for you, too. Have a better week, my friend. Glad your day got better.. Sometimes the quickest way to fix a bad day is to change your attitude… But it’s not easy! Thanks! I agree, I think it’s better to refuse to let it keep going that way! Looks like all the minuses worked themselved out to a plus filled day. Alls well that ends well. Thanks for sharing. Thank you for your comment. Glad to be able to have wrangled some good out of that day!